Darran Edmond founded Illicit Spirits a year ago and started distilling in Tradeston in April this year. The name is both a nod to the Illicit distillers of old (who inspired the copper pot still) and a reference to the fact it is hidden away in an unassuming arch under the tracks leading south from Glasgow central. Darran is one of the gin producers that wears many hats: he is, amongst other things, the distiller, bottler and the marketeer. Darran’s first degree was in Chemistry, but a love of whisky and an urge to see the world eventually led him to Heriot-Watt and the International Centre for Brewing and Distilling. Before this, Darran was set on distilling whisky but during the course, he discovered a love of gin. After graduating, he was part of the distilling team at Edinburgh Gin and The Glasgow Distillery – the rest, as they say, is history. Illicit Gin is the lead expression from Illicit Spirits with the “New Tom” just released, followed closely by a new Christmas gin. You may be familiar with the Old Tom style of gin – it dates to the 1800’s and became notorious as London’s gin scene was driven underground. The story goes that drinkers would look for cat-shaped wall plaques, drop a coin in the cat’s mouth, and a shot of gin would be dispensed from a tube. Old Tom is a sweeter style than most gins and closer to the Dutch Genever. 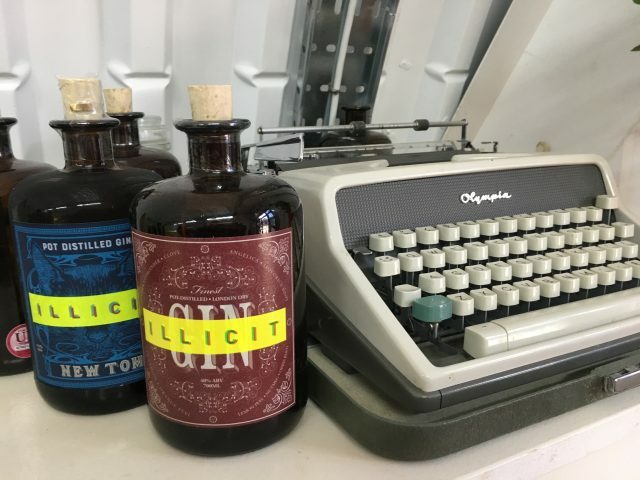 The Illicit Spirits New Tom is a modern day take on the Old Tom, and is full of berry sweetness, with vanilla notes at the end, from I think, the addition of tonka beans. The botanicals include pink peppercorns, rosehips, nasturtium flowers and tonka beans, many of which would not have been available in the 1800s, and then it is sweetened after distillation with Scottish blossom honey and bee pollen. Their New Tom label is a thing of beauty. It was inspired by posters of the Belle Epoque, but, most interestingly, the label has been designed by illustrator Alisdair Wood, who is best known for illustrating some of the most recognised action-adventure video games ever made. 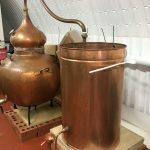 Darran, believes that Illicit Gin is taking gin back to its roots, but that does not stand in the way of innovation and experimentation. There are big plans in place for Illicit Spirits, so don’t be surprised when you see the neon Illicit label adorning another spirit or liqueur bottle in 2019. Illicit Gin is one of those gins that is so smooth, possibly due to the abundance of oily juniper, that it is great neat or with a tonic. It also goes very well with ginger beer, which complements the spicy notes. Find out more and shop for Illicit Spirits products here.